The Northwest Coast may soon see a record breaking mega-quake. In recent years, scientists and engineers have been able to predict seismic activity based on geologic data and information. Today, the consensus is that the Northwest coast is overdue for a catastrophic “Mega-quake”, or a natural disaster more intense than the devastating Haitian earthquake of 2010. Faults, or irregularities in tectonic plates, are particularly common in the Northwest. Spang said that while interacting, plates can do three things: “They can move apart; they can smash together; and they can move past each other. And each one of these events does different things.” But what’s happening just off the coast of Washington is unique. Among the active faults in the area, a place called the Cascadia Subduction Zone stands out. This is a 700 mile long fault between the North American Plate and the borders of three others to the west, lying just off the Northwest coast. Here, the Juan De Fuca Plate is slowly sliding beneath the continent, creating a shallow area that is extremely vulnerable to seismic activity. “With two plates hitting, they’ll lock up, and then when they slip […] You get an earthquake event,” said Spang. In simple terms, this is what geologists expect to see here. The North American Plate has been building up pressure since 1700, and in total, as determined by researchers at Oregon State University, the rupturing of the Cascadia Subduction Zone has induced 41 earthquakes over the past 10,000 years. This leads to an average recurrence interval of 243 years. Technically, this makes us 74 years overdue, but as Spang mentioned, “When they say overdue, that could be 200 years from now […] But, on the other hand, it might be tomorrow and we don’t know yet.” More specifically, we have an estimated 1 in 3 chance of a partial rupture occurring within the next fifty years, and a 1 in 10 chance of the entire zone giving way. The effects of either said earthquake would be disastrous, with a predicted ground acceleration of over 1g, or a shaking more intense than the natural vertical force of gravity. The economic damages resulting from this quake will be dreadful. 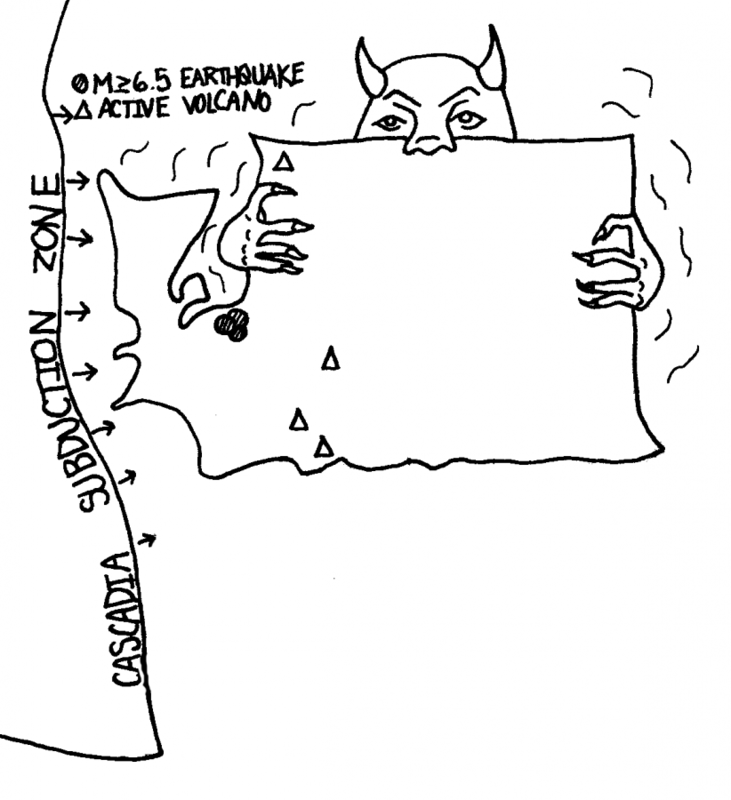 According to the city’s Official Seattle Disaster/Readiness Plan, we should expect the Cascadia Subduction Zone Megaquake to knock power out for months, cut off water supplies to most neighborhoods, trigger over 30,000 landslides within Seattle, and strike oceanfront communities with a tsunami measuring up to 30 feet tall. By the time the tremors end, the entire coast will have lost 6 feet in elevation. In the worst case scenario, everything west of Interstate 5 will be gone. Consequences could include nearly 30,000 casualties. However, some risk has been accounted for. “Some people say we’re gonna be pretty okay, cause when you have a slip, that causes energy to be released and this energy is released in waves,” said Spang. “Seattle’s kind of weird because a lot of the buildings that are around here are built to code, which means they’re gonna be able to withstand these waves of energy and they won’t shake and fall.” Since renovations made after the 2001 Nisqually Quake, Garfield High School has been altered to meet these standards. However, many buildings constructed before the 1997 instatement of the Uniform Building Code do not, and have a slim chance of surviving a quake of this caliber. Regardless, infrastructure will be hugely set back; even years after the quake, the Pacific Northwest’s economy will still be in shambles. It will take the combined effort of generations to rebuild. On January 26th in the year 1700, the Northwest coastal area was struck by an estimated 9.0 earthquake on the Richter Scale. It decimated Indigenous societies along the coast, and spawned a massive tsunami that swept entire villages away. The evidently massive drop in elevation and shift in coastal area created the cedarwood “Ghost Forest” on the banks of the Copalis River, where an entire forest of trees died after saltwater drowned their roots. And even earlier in history, around 900 AD, a 7.0 quake hit the area. Both became legendary among Native Americans, and their stories are still shared today.